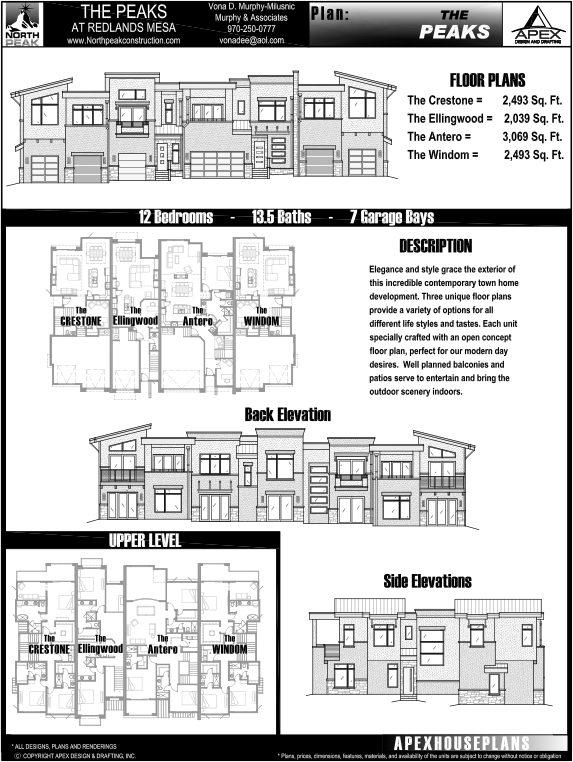 Available lots are highlighted in color unique to each development. Gray or uncolored lots are currently sold or otherwise unavailable. Redlands Mesa is not only an amazing destination for golf and luxury living. It is a pristine setting where we are preserving the incredible beauty of the natural area. When you build a home here at Redlands Mesa, you can enjoy stunning views of the Colorado National Monument, views of Grand Junction and more, and you get to experience life in one of the “world’s eight most exceptional golf course communities” as rated by the Robb Report. 40 Units. 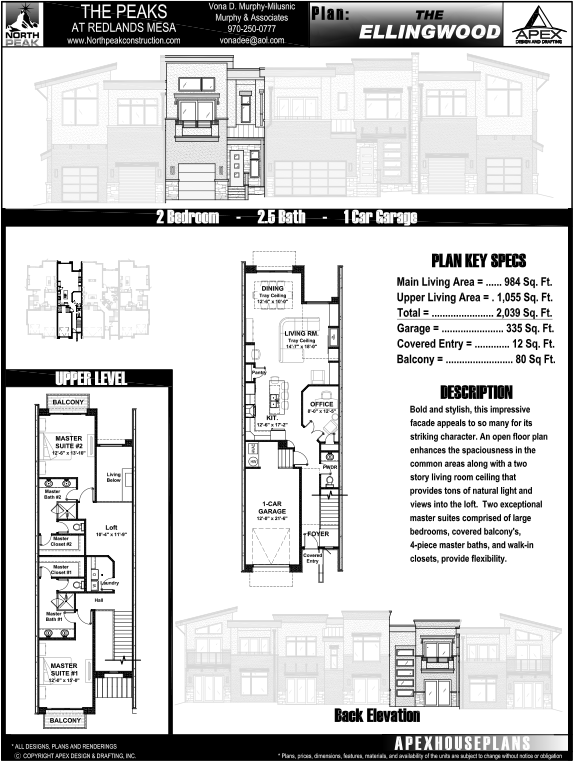 Custom 2, 3, or 4 bedroom townhomes built by North Peak Construction. This is a wonderful upscale townhome project right along the 7th hole of the golf course. 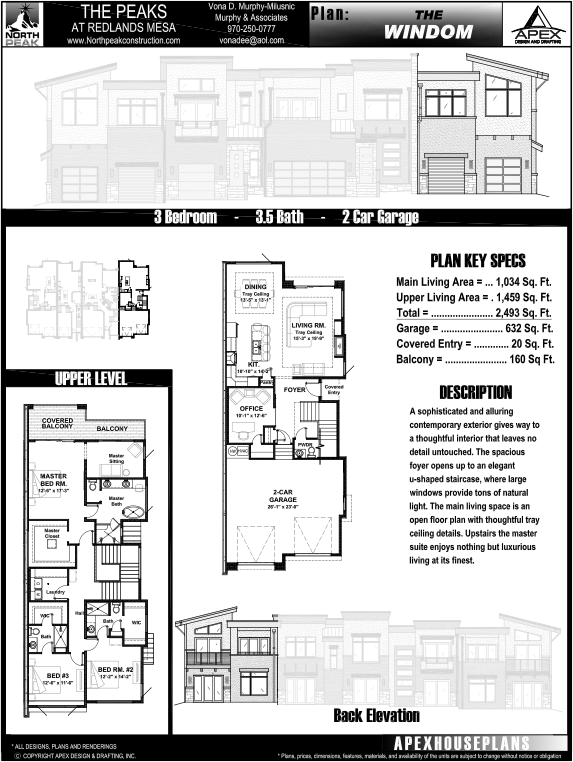 Built by North Peak Construction, there are 40 Townhomes, in 3 phases, ranging in size from 2-4 bedrooms. 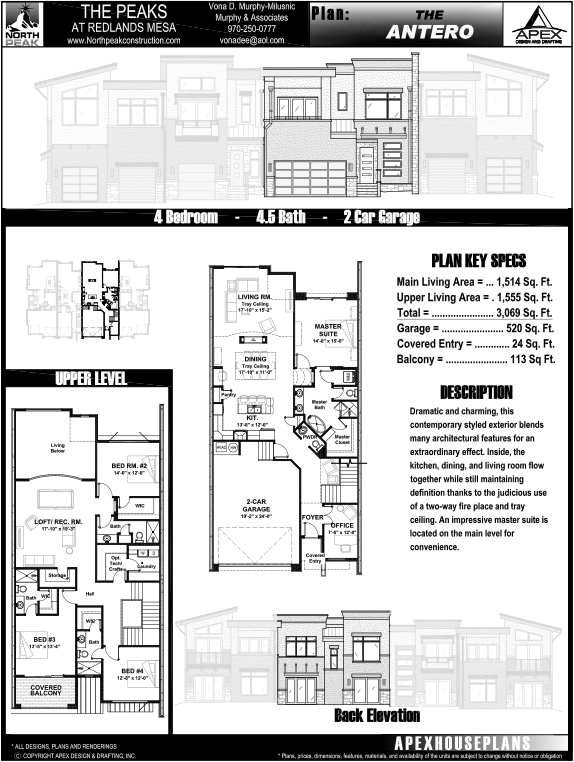 All of The Peaks townhomes come with a rooftop patio and a complementary 1 year family golf club membership! We have a design team that has put together a beautiful selection package that fits everyone’s needs. Available upgrades options include elevator. The HOA documents are available for your review, and the monthly fees are estimated to be approximately $258.00 per month. This site is strategically situated to capture some of the best views in the valley! Designed for your lifeslyle with a world class golf course, hiking, and biking trails located literally just outside your door! The use of native plantings provides an unparalleled lock and leave opportunity. Where the natural beauty reveals itself to you every day. Surrounded by stunning vistas, trails and bike paths, and the award-winning Redlands Mesa Golf Course, and just 5 minutes from downtown Grand Junction. The Ledges is Grand Junction’s ideal community for those who live an active lifestyle. With 29 custom homesites, modern-influenced architecture by one of the Grand Valley’s most respected builders, Porter Homes, and direct trail access, there isn’t a better choice when looking to build your new home. Each home is individually designed for the owner’s needs and taking advantage of the incredible views. Home prices starting in the low $500,000 range. One 10-Punch Card to Redlands Mesa Golf Club included with homesite purchase. Call today to inquire about the Ledges at Redlands Mesa. A beautiful home is like owning a beautiful painting, except you can live in it. With 23 homesites, one walk around the subdivision and you will see there isn’t a bad view. From expansive windows to patio spaces you will be able to take in the views year round. Featuring Desert Modern Design Elements, Clean lines, smaller yet functional Square footage ranging from 1400 – 2200 sqft. Finished or unfinished basement options on select lots. Prices are subject to change, lots are approximations. At Porter Homes, we know that building a custom home is a labor of love that requires a commitment of time, talent and attention to detail throughout the creative process. Nate and the entire staff will work alongside you to ensure every need and desire is met – marching to the tune of a pre-determined budget and timeline. With our proven process and online systems, we are able to anticipate and avoid challenges before they arise, so you are able to relax and enjoy the custom home building experience. In the end you will be a satisfied client of Porter Homes and will have a truly unique home that serves as a reflection of your lifestyle. We firmly believe we are not just building a home, but also a relationship that will last well beyond the completion of the building project. Welcome to Zag Built. With over 25 years of experience in the industry, Zag Built was started with one major principle in mind, uniqueness. We enjoy working closely with each client from the very beginning to create a home that is built your way, with your budget in mind, so that every detail reflects your individual style. We are dedicated to building homes that are unique, stylish and comfortable. We believe you should end up with a home that has great curb appeal, comfortable livability and lasting value. Everything about building with Zag Built is unique, from start to finish. The process we take you through results in an exclusive experience you just can’t get from other contractors. We take pride in our distinctive approach to create an experience that is an enjoyable one. Let Zag Built enhance your lifestyle and maximize your new home investment. Kevin Young, owner of North Peak Construction began his career working for some well-known builders, gaining experience in both Commercial and Residential real estate, in 2008 he opened North Peak Construction and has been fortunate to be building high-end custom homes ever since. He enjoys the process and looks forward to working with clients on creating their dream homes. Kevin brings vast experience and a down to earth approach to the building process.